Another December means another opportunity to do a Toy Run. 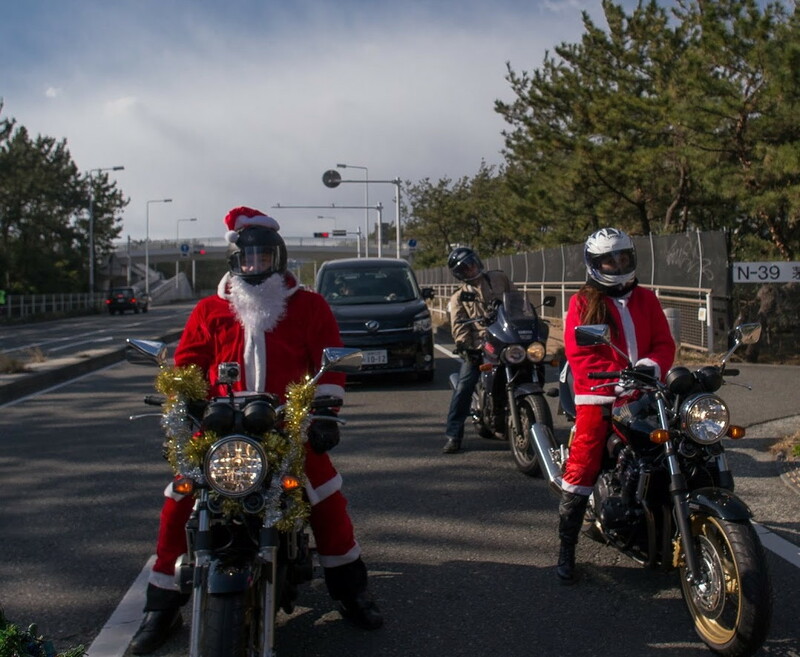 Bottom line: a bunch of bikers get together, deck the bikes with tinsel , dress up as Father Christmas, and go and spend the day with some kids at a couple of local Childrens Homes. I wrote up the previous ones from 2009, 2010 and 2011, which were all a little different, but equally fun. This year was no exception; due to some scheduling issues with one of the homes, we decided to take the whole group to both homes in one day, instead of splitting the group. We also changed the meet up point from Tokyo, to the Ebina service area in Kanagawa, to allow for more pillion riders, and to make some of the logistics for non Tokyo riders, that little bit simpler. In the end, these all turned out to be great decisions. 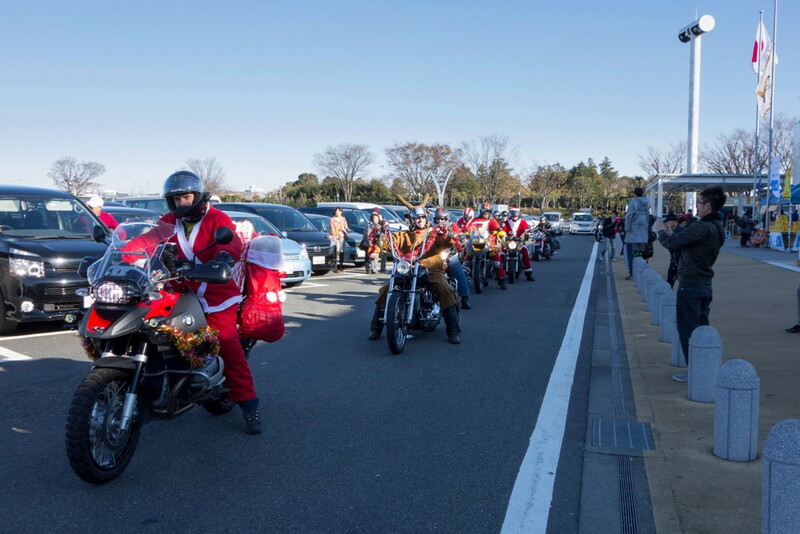 We always manage to score great weather, and I rode the 45Km up to the Ebina SA (I live much closer, but took a long route to get in the right direction) with my Santa outfit on, and the bike all decked out, so I was getting looks and waves from kids in passing cars, and even a request for a present from a guy on a construction site whilst I was waiting at some traffic lights. It was cold, very cold, but a beautiful day, with bright blue skies. It’s also worth noting that a Santa hat and beard securely fastened to your safety approved helmet is about as aerodynamic as a big pillow on an expressway. Ahead of schedule I met up with the riders already at the meet-up point, and we were already getting a lot of questions and requests for photos from just members of the public passing through what is a busy rest area on the Tomei Expressway, even at 9am on a Sunday morning. We cruised out of there to a fair smattering of applause, and a lot of very curious looks as perhaps thirty plus bikes snaked our way onto the Expressway to make our way down to the the first children’s home. On the short video below, we went through one toll booth and there was a Police bike parked near it and he really didn’t know what to make of it. Shame he couldn’t join in. Near the first home, we met up with some others who were joining from a different route, and all together we rolled in, and the kids loved it. Whilst some of us played games with the kids, we ate some soup and some pizza, handed out the gifts, and some of the kids got rides on the back of some of the bikes. After a couple of hours, we were off again to the second home, making our way down the coastal road, getting a lot of waves from fellow bikers, as it’s a really popular route. The second place is a little smaller, so we were cramming the bikes in, but the kids there are great too, and they’d also made some good soup, and cooked up some pizzas we’d brought, in a home made pizza oven, and we stood and chatted, played bingo and let them take the tinsel off a lot of the bikes. We learned quickly that the gifts are important, but the kids really like the bikes, chatting with us, wearing the Santa outfits, and really just having a bit of a party, which is what it’s all about. It’s sometimes amazing how the kids are growing up too, and some are getting jobs, and the small ones, just babies in 2009, are now walking and talking. It must be a difficult start for some of them, but I think these kids are going to make a really good go of life, and I hope next year they let us come back again, and see if we can make it that little bit better once more.